Check out this article in the UK's Guardian newspaper on the results of the Worldwatch Institute's State of the World report. The key to alleviating world hunger, poverty and combating climate change may lie in fresh, small-scale approaches to agriculture, according to a report from the Worldwatch Institute. The US-based institute's annual State of the World report, published Jan. 12, calls for a move away from industrial agriculture and discusses small-scale initiatives in sub-Saharan Africa that work towards poverty and hunger relief in an environmentally sustainable way. The authors suggest that instead of producing more food to meet the world's growing population needs, a more effective way to address food security issues and climate change would be to encourage self-sufficiency and waste reduction, in wealthier and poorer nations alike. "If we shift just some of our attention away from production to consumption issues and reducing food waste, we might actually get quite a big bang for our buck, because that ground has been neglected," said Brian Halweil, co-director of the project. "The majority of incentives that governments give to farmers are still tied to the production mindset. The farmers are rewarded for sheer production quantity, with very little guidance for the quality they produce and the impact of their farming practices on the environment and on human health and nutrition ... It is necessary to change these incentives," he said. The projects explored in the report include community-based initiatives in urban farming, school gardening and feeding programmes, and indigenous livestock preservation. In Kenya's largest slum, in Nairobi, local women are growing vertical gardens in sacks, providing them with a source of income but also an element of food security for their families. "They sell their produce and also consume part of what they grow," said Danielle Nierenberg, Halweil's co-director. "As we talk about all these innovations, it's important to remember that farmers aren't just farmers: they're businesswomen and -men, they're stewards of their land and they're educators passing on their knowledge to others in their communities," she said. 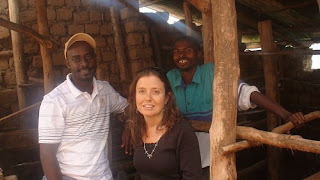 To read more about Nierenberg's year of research in sub-Saharan Africa (shown at right at a Heifer Rwanda project), see our World Ark interview with her in the current issue. Also look for more insights here after a visit to Heifer International headquarters by Nierenberg in early February. Photo courtesy Worldwatch's Nourishing the Planet.